Beemans old time nostalgic gum is back, however it won't be around for ever. The original pepsin flavor gum from the Adam's company. Each pack has 5 sticks of chewing gum. Each box of beemans has 20 packages. If you don't want a whole box no problem we also sell beemans gum by the pack. Did you know that beemans gum has been around since the late 1800's ? That makes this gum over 100 years old. Dr. Edward E. Beeman had the idea of adding pepsin powder to chicle inventing beemans gum. Dr. Beeman was from Ohio and gave pepsin to his patients to help aid them with indigestion and heart burn, so he invented a pepsin powder. Dr. Beemans bookkeeper, Nellie Horton, suggested that he put the pepsin into chewing gum since so many people buy pepsin for digestion and chewing gum for no reason at all. Beeman blended his pepsin compound with chicle and printed each label with a pig, the logo for his pepsin powder With pepsin, you can eat like a pig . Beeman s financier later switched out the pig for a photo of Beeman s bearded face, which boosted sales even higher. In 1898, after almost 20 years of limited production and distribution, Beeman s became part of the Adams Company and was mass produced for the first time. Beemans gum is still being manufactured today by Cadbury Adams. It is also known as an old time nostalgic gum. Beemans gum was featured in the following movies The Right Stuff, Hot Shots!, and The Rocketeer. 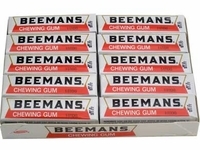 Beemans gum is a favorite gum from the 50's and 60's. Even though it is still made today the production is limited. Making this a hard to find gum. Admams company only comes out with it every 3 - 5 years. Besure to stock up now as it will be gone again before you know it.